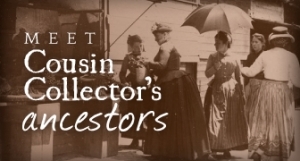 Even those new to family history research can learn the basics of properly evaluating evidence in genealogy. Once you learn the simple process and begin practicing it, you will find yourself mentally evaluating evidence as you discover each new piece of information about your ancestors. As you get into more complex identity problems and work with less standard sources, better evidence analysis will improve the quality of your research and increase the likelihood of solid conclusions about your ancestors’ lives. This overview will give you a good starting point and is written with the beginner in mind; for a more in-depth discussion of evidence analysis and genealogical standards, I recommend The BCG Genealogical Standards Manual published by the Board for Certification of Genealogists. Sources and information can be evaluated independently, but evaluating evidence in genealogy cannot be completed without the question we are trying to answer. Authored sources are written works that do not fit neatly into either category (an excellent discussion about classifying authored works can be found in the Evidence Explained forums), but which can be considered one or the other depending on their content. Some genealogists consider authored works a third category, while others classify the them as original or derivative based on the content. Original analysis in an authored work would be considered an original source, while a transcription of a document or quoted material in an authored work would be considered a derivative source. Understanding the difference between these source classifications helps the genealogist to evaluate the reliability of the information found in the source. Example. Is the source a book of early will transcriptions? Derivative sources like transcriptions introduce the possibility of errors. Is the source an original death register created at the time of death? Original sources like vital records are usually created by individuals working in an official capacity where accuracy is important. While classifying a source is important, whether a source is original or derivative is not an indication of the reliability of the information it contains. To determine that, we must classify the information. Once you have evaluated the source (or “container”), the information inside is evaluated. Individual pieces of information are often called “facts” but they may not actually be factual. Evaluating each piece of information is a crucial step in determining its reliability. Information can be primary, secondary, or undetermined. Each source can have multiple pieces of information, and each piece may have a different information classification. A new researcher might assume that because a source is an official document such as a death certificate, it is a “reliable source” for all of the information it contains. All information in a source can never be grouped together and classified as a whole–it must be individually evaluated. Example. Using our death certificate example, the time and place of death on a death certificate signed by the attending physician is primary information–the physician had first-hand knowledge of the event. It is unlikely, however, that the physician had first-hand knowledge of the date and place of birth of the deceased on the same document. To classify that information, we must look to the informant listed in the source. If the deceased is a child and the informant is the parent, the birth information would be primary. If the deceased is an adult and the informant is the spouse, the date and place of birth is secondary information because the spouse was not there and does not have first-hand knowledge of the birth. A common example of undetermined information is that found in census population schedules prior to 1940. Starting in 1940, the enumerator placed a mark beside the name of the person who provided the information for the household. Prior to that, there is no way to tell who spoke to the enumerator, making the information of undetermined origin. 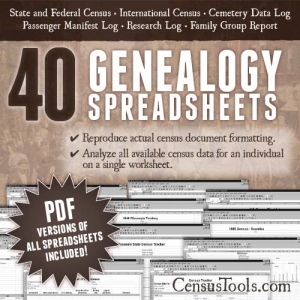 The only way we could know in a census population schedule that the information is secondary is if the census marks the informant, and we determine that the informant did not have first-hand knowledge of the information asked (for example, a spouse of the head of household providing information about the birthplace of her father in-law). You might find it odd that a person’s answers about their own birthplace is considered secondary, but that information is only what they have been told. We cannot confirm with firsthand knowledge where or when we are born because we have no memory of it. On the other hand, as parents we can confirm when and where our children were born, making it primary information. Information only becomes evidence when we are trying to answer a question with it. By itself, it is only information. Evidence is classified as direct, indirect, or negative. 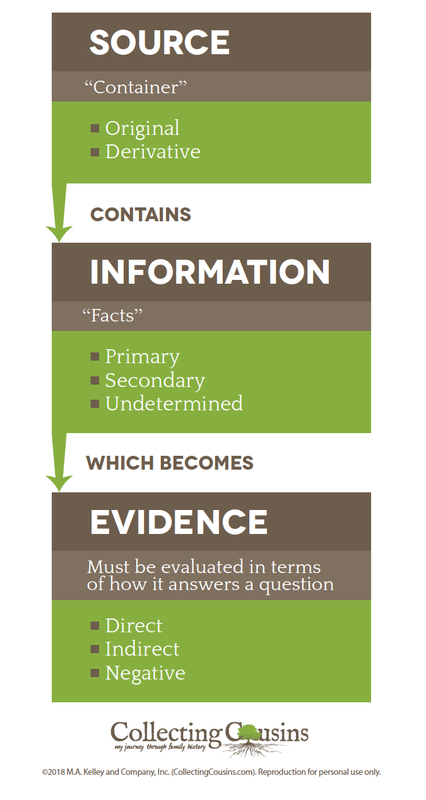 The common thread of each classification for evidence is that it must relate to a question. Without a question, evidence cannot be evaluated. Example. Using a census as an example again, let’s suppose that we are researching John Martin and want to know when his wife Mary died. To keep the example simple, let’s assume that we already know that John and Mary got married in 1855 and John had no other marriages before or after his marriage to Mary. Research question: When did Mary Martin die? In 1860, a census lists John and Mary Martin in the same household. This is direct evidence that Mary is still alive when the census was enumerated. In 1870, the census lists John alone in the household. Mary’s absence in the household is negative evidence for her death–we would expect to find her there and her absence infers that she could be deceased. We cannot conclude that she is deceased, however. In the absence of corroborating evidence we have to consider that she may have left her husband, or that she was living elsewhere caring for a parent, or any other number of possible circumstances. An 1880 census listing John alone in the household and states that he was widowed is indirect evidence of Mary’s death sometime prior to the official census date. It is only when combined with the information that John did not have any other marriages that we can determine that he is Mary’s widower and not a widower from a subsequent marriage. 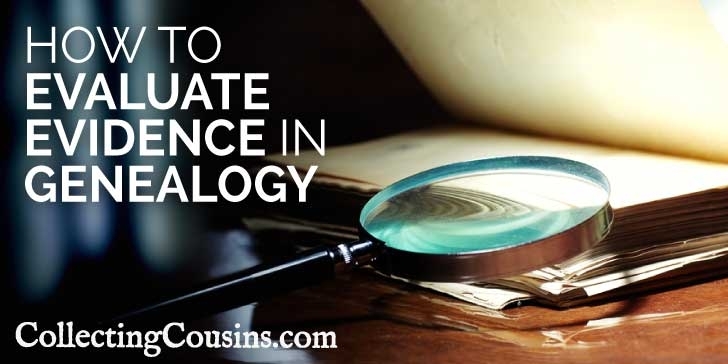 In genealogical research, we have to combine all three elements of evidence analysis to get a full picture of the reliability of the evidence. The quality of the source, the quality of the information, and what kind of evidence the information provides all contribute to making a solid conclusion. It is not uncommon to find five or six sources with differing information about a particular event, so being able to analyze each in accordance with the genealogical standards will allow you to accurately determine which is the most reliable. Need help remembering the options for sources, information, and evidence? Download the cheat sheet below and keep it handy while you are working. 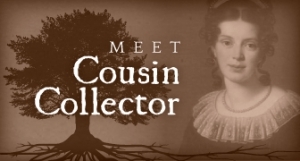 Choose an ancestor for which you have multiple birth dates asserted. Evaluate the source for each, determine whether each assertion is primary or secondary, and evaluate how the evidence relates to the question of when your ancestor was born. I’d love to hear what you discovered and if your analysis helped you to come to any conclusions! The BCG Genealogical Standards Manual – The Board for Certification of Genealogists is the authority on genealogical standards. This manual is a helpful reference for evidence analysis as well as the genealogical proof standard (GPS). Evidence Explained (affiliate link) – The first chapter of Elizabeth Shown Mills’ handbook for citations discusses evidence analysis at length. I have both the hardback and the Kindle version, and I much prefer the Kindle version to the physical book because I can have it open as a reference on my MacBook while I am working. Mastering Genealogical Proof (affiliate link) – Tom Jones’ book in the National Genealogical Society’s Special Topics Series thoroughly covers the genealogical proof standard to include evidence analysis. The Special Topics Series titles are workbooks that give the opportunity to answer questions and practice your skills. Evidentia Software – Evidentia walks you through the process of evaluating each assertion found in a source as well as creating citations. If you are overwhelmed by the evidence evaluation process, using Evidentia is a painless way to start.